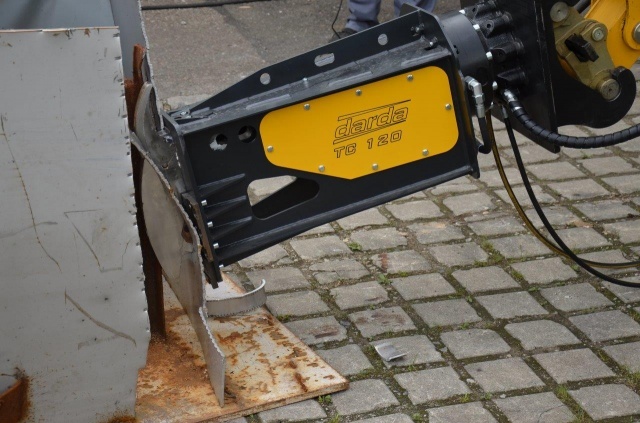 The German company Darda, based in Blumberg in the famous Black Forest recently launched the TC120 tank cutter for cold cutting of steel containers and slabs of up to 15mm thick. Designed for 3t to 8t mini-excavators or the 260 Brokk demolition robot, it weighs 270kg with the rotary drive and boasts a cutting force of up to 660kN. When dealing with steel walls up to 5mm thick, its cutting performance can reach as much as 60-90m3/h. The TC120 cuts structural steel, stainless steel plates and all kinds of tanks. The cutter is operated from a safe distance without the need for mobile scaffolding. The process of cold cutting excludes the risk of fire or explosion when dismantling tanks with residual content. Thanks to its compact dimensions, the TC120 tank cutter can operate in limited spaces.